Brian discovered his love of adventure during his pre-season cross country team camps in high school. He never imagined that a week in the woods without technology would be enjoyable, but between the exploring, team-building, and beauty of the outdoors, it quickly became his favorite week each year. Brian hopes to enable other youth to explore the joy of experiential learning and adventuring. 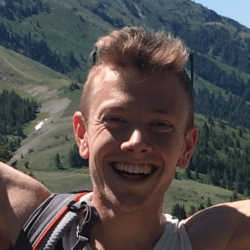 After graduating from Cornell University with a degree in biology, Brian moved back to his hometown in Oregon to train competitively with Team Run Eugene. After two years there, he wanted something new and moved to Fort Collins. There he found No Barriers and loved the organization’s mission to create outdoor experiences that are accessible to everyone. Outside of the office, Brian trains with Siemers’ Dreamers, which is a local running team. He enjoys rock climbing, making smoothies, and curling up in his heated blanket with a cup of tea.